Numerian (Latin: Marcus Aurelius Numerius Numerianus Augustus; died November 284) was Roman Emperor from 283 to 284 with his older brother Carinus. They were sons of Carus, a general raised to the office of praetorian prefect under Emperor Probus in 282. In 282, the legions of the upper Danube in Raetia and Noricum proclaimed as emperor Numerian's father, the praetorian prefect Marcus Aurelius Carus, beginning a rebellion against the emperor Probus. Probus' army, stationed in Sirmium (Sremska Mitrovica, Serbia), decided they did not wish to fight Carus and assassinated Probus instead. 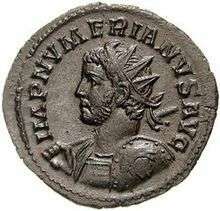 Carus, already sixty, wished to establish a dynasty and immediately elevated Carinus and Numerian to the rank of Caesar. In 283, Carus left Carinus in charge of the West and moved with Numerian and his praetorian prefect Arrius Aper to the East to wage war against the Sassanid Empire. The Sassanids had been embroiled in a succession dispute since the death of Shapur and were in no position to oppose Carus' advance. According to Zonaras, Eutropius, and Festus, Carus won a major victory against the Persians, taking Seleucia and the Sassanid capital of Ctesiphon (near modern Al-Mada'in, Iraq), cities on opposite banks of the Tigris. In celebration, Numerian, Carus, and Carinus all took the title Persici maximi. Carus died in July or early August of 283, possibly due to a strike of lightning. The death of Carus left Numerian and Carinus as the new Augusti. Carinus quickly made his way to Rome from Gaul, arriving in January 284, while Numerian lingered in the East. The Roman retreat from Persia was orderly and unopposed, for the Persian King, Bahram II, was still struggling to establish his authority. By March 284, Numerian had only reached Emesa (Homs) in Syria; by November, only Asia Minor. In Emesa he was apparently still alive and in good health, as he issued the only extant rescript in his name there. Coins were issued in his name in Cyzicus at some time before the end of 284, but it is impossible to know whether he was still in the public eye by that point. After Emesa, Numerian's staff, including the prefect Aper, reported that Numerian suffered from an inflammation of the eyes and had to travel in a closed coach. When the army reached Bithynia, some of Numerian's soldiers smelled an odor reminiscent of a decaying corpse emanating from the coach. They opened its curtains and found Numerian dead. Aper officially broke the news of Numerian's death in Nicomedia (İzmit) in November 284. Numerian's generals and tribunes called a council for the succession and chose as emperor Diocletian, commander of the cavalry arm of the imperial bodyguard, despite Aper's attempts to garner support. The army of the east gathered on a hill outside of Nicomedia and unanimously saluted their new Augustus. Diocletian accepted the purple imperial vestments and raised his sword to the light of the sun, swearing an oath denying responsibility for Numerian's death. He asserted that Aper had killed Numerian and concealed the deed. In full view of the army, Diocletian then turned and killed Aper. According to the unreliable Historia Augusta, Numerian was a man of considerable literary attainments, remarkably amiable, and known as a great orator and poet. No other sources, however, report anything about his personality. ↑ In Classical Latin, Numerian's name would be inscribed as MARCVS AVRELIVS NVMERIVS NVMERIANVS AVGVSTVS. ↑ Barnes, Constantine and Eusebius, p. 4; Leadbetter, "Carus"; Odahl, Constantine and the Christian Empire, p. 39; Southern, Severus to Constantine, p. 132; Williams, Diocletian, p. 32. ↑ Barnes, Constantine and Eusebius, p. 4; Odahl, Constantine and the Christian Empire, p. 39; Southern, Severus to Constantine, p. 132. ↑ Odahl, Constantine and the Christian Empire, p. 39; Southern, Severus to Constantine, p. 132; Williams, Diocletian, p. 32. ↑ Barnes, Constantine and Eusebius, p. 4; Odahl, Constantine and the Christian Empire, p. 39; Williams, Diocletian, p. 32. ↑ Leadbetter, "Carus"; Odahl, Constantine and the Christian Empire, p. 39. ↑ Zonaras, 12.30; Eutropius, 9.14.1; Festus, 24; Barnes, Constantine and Eusebius, 4; Leadbetter, "Carus"; Odahl, Constantine and the Christian Empire, p. 39; Potter, The Roman Empire at Bay, p. 279; Williams, Diocletian, p. 33. ↑ Barnes, Constantine and Eusebius, p. 4; Leadbetter, "Carus." ↑ Barnes, Constantine and Eusebius, p. 4; Leadbetter, "Carus"; Odahl, Constantine and the Christian Empire, p. 39; Southern, Severus to Constantine, p. 133; Williams, Diocletian, pp. 33–34. 1 2 Barnes, Constantine and Eusebius, p. 4. 1 2 Southern, Severus to Constantine, p. 133. ↑ Barnes, Constantine and Eusebius, p. 4; Leadbetter, "Numerianus." ↑ Codex Justinianus 5.52.2; Leadbetter, "Numerianus"; Potter, The Roman Empire at Bay, p. 279. ↑ Roman Imperial Coinage 5.2 Numerian no. 462; Potter, The Roman Empire at Bay, pp. 279–80). ↑ Barnes, Constantine and Eusebius, p. 4; Leadbetter, "Numerianus"; Odahl, Constantine and the Christian Empire, p. 39; Williams, Diocletian, p. 35. 1 2 Potter, The Roman Empire at Bay, p. 280. ↑ Barnes, Constantine and Eusebius, p. 4; Barnes, New Empire, p. 31; Bowman, "Diocletian", p. 68; Mathisen, "Diocletian"; Williams, Diocletian, p. 33, 35-36. 1 2 Barnes, Constantine and Eusebius, pp. 4–5; Odahl, Constantine and the Christian Empire, pp. 39–40; Williams, Diocletian, pp. 36–37. ↑ Barnes, Constantine and Eusebius, pp. 4–5; Leadbetter, "Numerian"; Odahl, Constantine and the Christian Empire, pp. 39–40; Williams, Diocletian, p. 37. Leadbetter, William. "Carus (282–283 A.D.)." De Imperatoribus Romanis (2001a). Accessed February 16, 2008. Leadbetter, William. "Numerianus (283–284 A.D.)." De Imperatoribus Romanis (2001b). Accessed February 16, 2008. Leadbetter, William. "Carinus (283–285 A.D.)." De Imperatoribus Romanis (2001c). Accessed February 16, 2008. Mathisen, Ralph W. "Diocletian (284–305 A.D.)." De Imperatoribus Romanis (1997). Accessed February 16, 2008. Wikimedia Commons has media related to Numerian. Italics usually indicate an usurper or co-emperor.